Whenever I'm in apostlebird country, I always hang onto my car keys. Not that I'm suggesting that apostlebirds are hooligans, but I don't want to get into my car to drive home and then find the glove box ransacked, the dashboard covered in grey feathers and the front seat coated with bird poop. This hasn't actually happened yet. I attribute that entirely to my care with the keys. Apostlebirds form family groups in the breeding season and maintain a small territory. At other times, they roam further and their social structure is much less rigid. Groups that meet during the non-breeding period may join up and forage together (often around picnic tables) or even swap members. The exchange of individuals helps prevent the sort of scenario that you might expect if Wes Craven remade The Birds. Actually, that's a movie I'd pay to see. As long as the grey-plumaged hoodlums didn't steal my wallet first. Actually one of my favourite birds. Very comical, and yes, I am sure they would steal anythingt hey took a fancy to. That was from my day at Chillagoe. I still have some pics of the caves to come. I think they're wonderful. 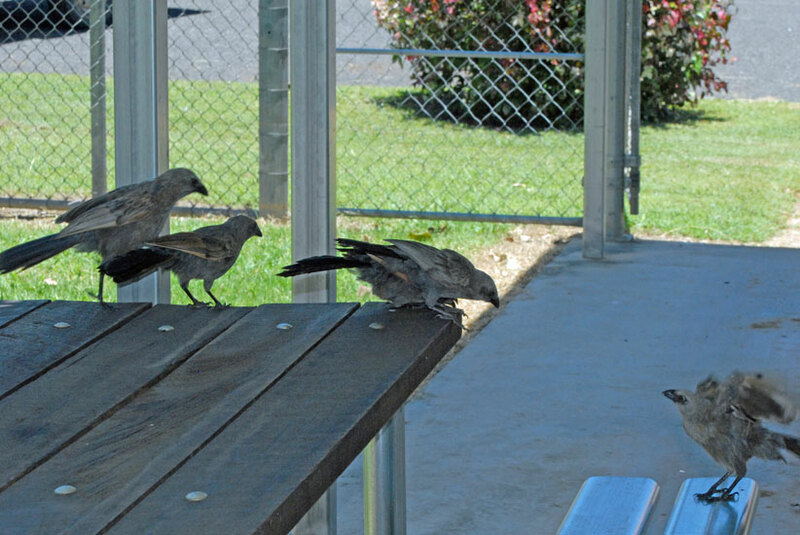 If I lived in a drier area I'd want it to be somewhere well provided with apostlebirds. What fun to watch birds with antics like those! Mind you, I wouldn't want to be on the receiving end of their mischief! Mick, they are always on the go --- like wind up toys! Lyn, a great video! 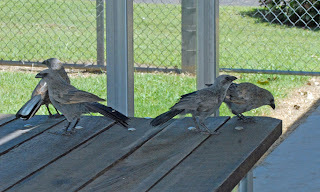 Luckily the apostlebirds don't appear to be that organised or destructive. It's probably just as well that keas aren't more common. Could you imagine what big flocks of them could do! at least they're not so brazen as to pickpocket??! they just take what might be lying around...left on the bench while you're eating? Great photos! Glad they didn't get your keys, but you could always use that for an excuse if you ever misplace them! LOL! Who said bids don't have attitude? Not many Apostles in theses parts either, but I love watching our Choughs as the families scour the leaf litter in the woodlands. Laura, yes, that's the place! 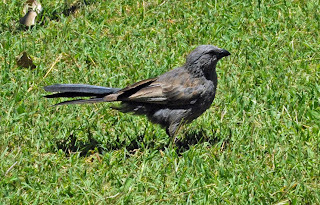 Apostlebirds tend to live in drier areas. They really are funny little things --- very vocal and they fight and squabble and chase one another if there's something worth having. Meggs, they did get a bit of sandwich! They didn't eat it, but used it as some sort of trophy. Weird. Gouldiae, these birds have so much attitude! I love choughs too, but we're too far north for them here. 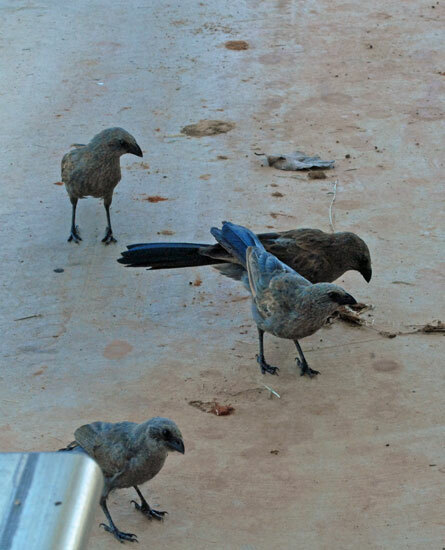 The apostlebirds aren't quite as good as swaggering as are the choughs. they sound a little like the crows we have here...same family i guess (?). they're really smart...and can be kind of aggressive to other birds. i've never had one 'steal' anything...but i have seen them chase away the much bigger owls! They do look and behave like corvids, don't they? 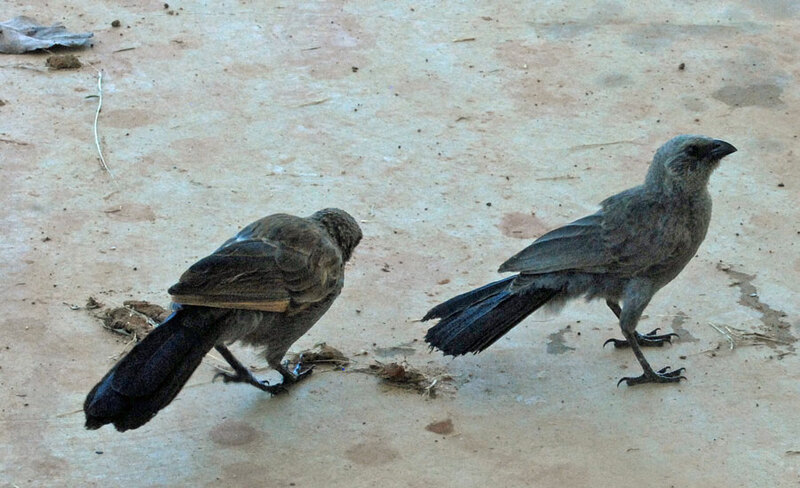 But they and white-winged choughs are the only two species in a different family: Corcoracidae. I'm just wondering if anyone has more information on waht they eat.. I know they eat seeds & bugs but can anyone be more specific to types of seed & bugs.... Must be more related to the areas they live...? Anything perticular...? Denny, I think they have a fairly wide diet. 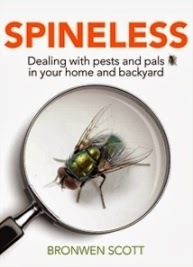 Perhaps it would be worth contacting one of the wildlife rescue places for advice? Here's a searchable database that will locate a rescue organisation for a postcode or town. 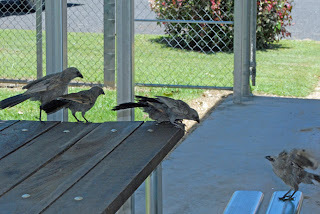 Its not just feeding they need, but socialisation, or training to fly, or checking for injury. I successfully fed a baby Magpie for a week, but it needed more than I could give it (mince is not a natural diet). Also it needed to flap its wings, etc. Sitting in a box is bad for young or injured birds. That's why snail's suggestion is good. Best wishes and good luck with it.